The Nation's first Certified LEED Platinum CI project, Council Tree Library is located in Front Range Village in Fort Collins. 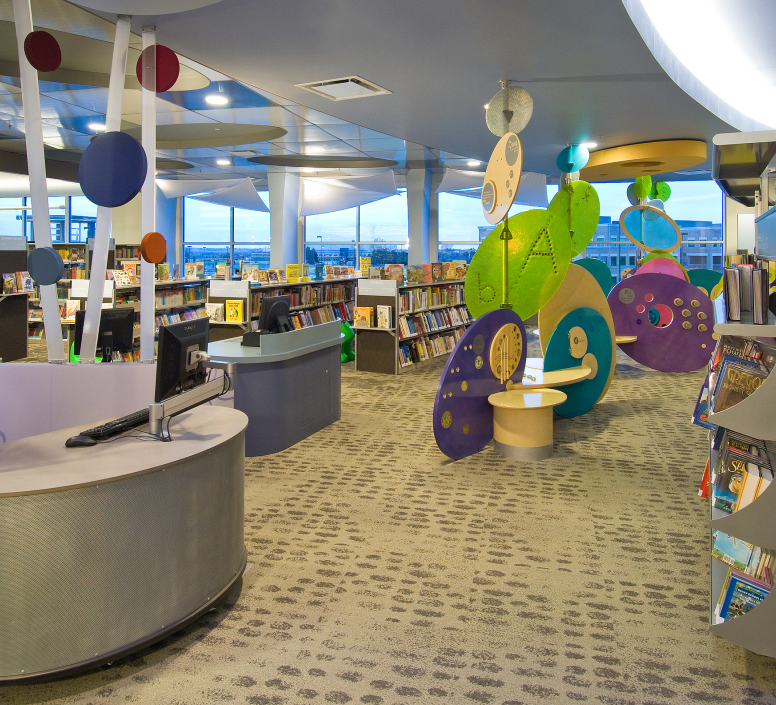 The 17,000 square foot library provides a progressive, modern interior coupled with services tailored to a new library experience. Taking advantage of its location in a mixed-use development, the new branch reinvents the traditional public library while simultaneously enhancing the adjacent shopping experience. This synergistic relationship between a public library and private sector commercialism is rarely as apparent as exists at the Council Tree branch. The cross-pollination between ‘Village’ shoppers and library patrons is palpable and makes a profound statement about the role of a public library in contemporary society. All of the signage and most of the furnishings were also designed by studiotrope. This approach ensured a highly functional interior without sacrificing distinctiveness.